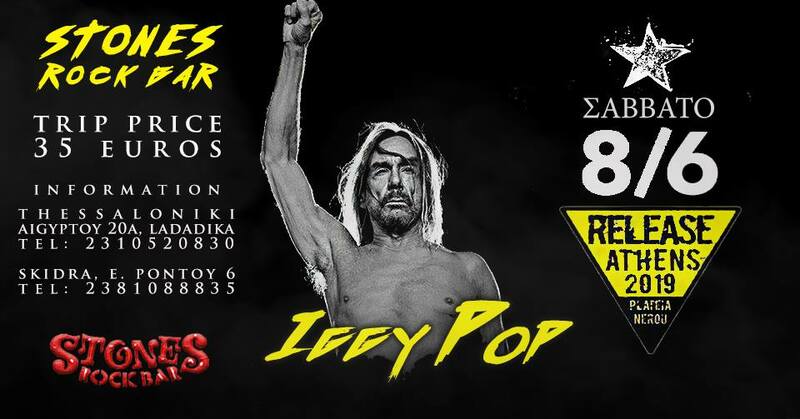 Iggy Pop – Release Athens 2019 Concert Trip. Release Athens 2019 welcomes one of the greatest figures in the history of rock’n’roll, Iggy Pop. As the Release company announced, Iggy Pop arrives in Athens on Saturday, June 8, for a unique concert at Plateia Nerou, and the pre-sale has begun on Friday, November 23rd. Punk’s Godfather, live legend of rock, not just as a musician, but also as a mentality and attitude of life, does not really require recommendations. Every rock and, above all, punk band or artist “borrowed”, consciously or unconsciously, a couple of things from Iggy. “Lust For Life”, “The Passenger”, “Candy”, “Nightclubbing”, “China Girl”, “I’m Bored” are just some of the great hits we are expected to hear at Plateia Nerou.